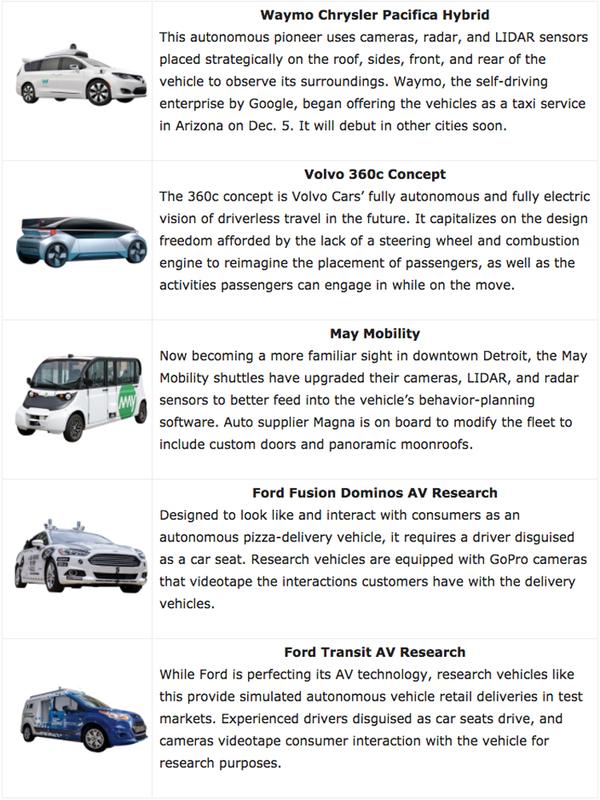 Global automakers will roll out autonomous vehicles in the new year. After the self-driving shakeout, which OEMs and auto suppliers will stay in the game, and which new players will join the fray? On a recent Friday morning, before fine-tuning the slides he planned to use during a speaking trip to London, Larry Burns took his family’s two dogs to the vet. One is a 14-pound Maltipom, the other a larger mixed-breed rescue. Like a lot of people, Burns, who lives in Franklin, didn’t know dogs get the flu — but because of an outbreak in Oakland County, he needed proof of vaccination just for grooming. Although Burns, the former head of General Motors’ R&D efforts, admits he was preoccupied with squeezing in the trip to the vet, he was still able to plan how he intended to promote his new memoir, Autonomy: The Quest to Build the Driverless Car — And How It Will Reshape Our World, co-written with Christopher Shulgan. Autonomy shares with the reader a personal account of the development of robot vehicles, starting with the GM Autonomy concept car that, in 2002, offered a “skateboard-like platform similar to what underlies today’s Tesla models.” Batteries or a hydrogen fuel cell filled the platform’s inner cavity to provide power for electric drive. In turn, the lightweight body could be easily swapped; any number of variants could be created. Before leaving GM in 2009, Burns worked on another concept vehicle, the “autonomous, shareable, and electric” EN-V. Developed with Segway Inc., the self-balancing two-seat capsule with wheel pants and a racy paint job made its debut at Expo 2010 in Shanghai, introducing itself as the ever-devoted mobility-bot. The self-driving future involves lighter cars with, he estimates, only 10 percent of a vehicle’s current parts. Electric drive — suitable for fleet managers’ predilections for low cost-per-mile and regulators’ zero-emission objectives — locates motors inside the wheels. The combustion engine, transmission, driveshaft, differential, and axles are discarded. Furthermore, there will be no radiator, exhaust system, starter motor, gas tank, lead-acid storage battery, or other heavy and expensive parts. Autonomous driving means there’s no need for a steering wheel, an accelerator, or a brake pedal. The traditional dashboard will change, as well. For auto suppliers that craft today’s parts and components, it could be a tough future. The whole auto industry may downsize. 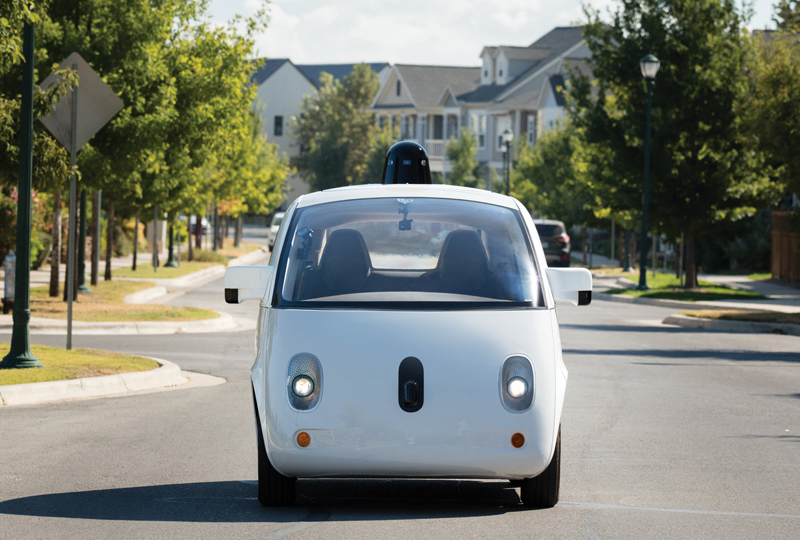 An early version of Google’s autonomous car paved the way for Waymo and many of the other self-driving vehicles being developed today. Yet in dense cities, as Burns experienced on a recent family trip to Lima, Peru, he sees opportunity. “I think an autonomous six-person to 12-person vehicle that’s demand-responsive could be a very, very interesting way to move people around,” he says. In other words, although he didn’t say so, he was referring to the Autonom Shuttle. The sleek, autonomous navette, or shuttle, made by Navya, a five-year-old French company, is an inch shorter than the Chevrolet Camaro but 8.5 feet tall. It has the same headlights, grille, LIDAR pavilions, and badge on both ends, making it a bidirectional vehicle. (A single-direction version is also available.) As on a subway car, a set of retracting double-doors allows people in and out. There’s also a 15-inch screen with route information for passengers (11 sitting and four standing; or, in Wisconsin, nine sitting and three standing), and two big 38-inch screens to display the destination to onlookers. With a battery-electric powertrain, the Autonom Shuttle goes up to 25 mph — fast enough for first- and last-mile applications. Four-wheel steering lets the shuttle turn around in just 14.7 feet, like a seal when bait spills from the boat. The vehicle bristles, of course, with cameras inside and out, complemented by eight LIDAR units (light and radar) to detect obstacles, whether it’s on the MCity self-driving course in Ann Arbor, the University of Michigan campus, or the Las Vegas strip, where it’s billed as the first autonomous shuttle in the United States to run in open traffic. In July 2017, with assistance from a $435,000 state grant, Navya announced its $2-million North American assembly plant, a 20,000-square-foot facility in Saline, near Ann Arbor. Production started last May. Each unit is built to order, and has a base price of $325,000. In addition, May Mobility in Ann Arbor, which builds and operates a low-speed autonomous shuttle, began service in downtown Detroit over the summer. The six-seat electric shuttles also operate in Grand Rapids and, soon, Columbus, Ohio. For passengers, the rides are free — for now. Designing an autonomous vehicle from the ground up means more effective sensor placement, as proven by the Google Firefly. Conceived by Google’s Chauffeur (now Waymo) self-driving team, to which Burns started contributing strategy after leaving GM, the Firefly came to life in 2014. Roush Industries in Livonia, better known for its ferocious adaptations of Ford Mustangs, built a fleet of 100 Fireflys. The mobility pod shocked the world by having no steering wheel. Burns writes that designers YooJung Ahn and David Rand “came up with a simple, clean, and fun aesthetic.” Frankly, it broke no ground that hadn’t already been covered by the Little Tikes Cozy Coupe, and it evoked disbelief that Google co-founder Larry Page had learned anything from his grandfather, who built Chevrolets in Flint. It was the autonomous egg that car guys feared, looking sour and discomposed, as if its binky had been knocked loose by a chuckhole. On the Firefly’s roof, the LIDAR dome seemed to beg for treatment with anti-inflammatory ointment. Without fanfare, the Firefly retired from service in 2017, but it had established the reality of autonomy while also earning a nickname from Burns: The Ultimate Riding Machine. Volvo’s driverless concept uses several front- and rear-facing cameras, sensors, and LIDAR to sense its environment. Although Chevrolet will soon debut the autonomous Cruise AV in 2019, an immediate switchover to full autonomy is a myth — a point doubly emphasized by Brian Daugherty. When he directed global advanced development for Visteon Corp. in Van Buren Township, Daugherty worked with Burns on the development of the GM Autonomy’s “steer-by-wire” system that dispensed with a traditional mechanical steering linkage. Now chief technical officer for the global Motor and Equipment Manufacturers Association, the trade group for motor vehicle and mobility suppliers, and parts manufacturers, Menchaca, like Daugherty, survived a ride in the Navya Arma and a good number of other autonomous dreadnaughts, yet he tempers the notion of a sudden “wholesale” change. “We’re going to see a lot of demonstration projects in urban, robo-taxi-type environments,” he says. In other words, what Navya is already doing. Even without leaping to autonomy, but following a restrained step-by-step process, the minds of transportation designers are afire. Every week, it seems, these Galileos show off new concepts meant to ease the commute or solve the riddle of the last mile. Their ideas extend from updates on sedans and crossover vehicles to solutions for heavy trucking. GM made a ripple in 2017 with an imaginative, upsized adaptation of Burns’s skateboard chassis. The Silent Utility Rover Universal Superstructure, better known as SURUS, deserved wider attention. With a tinted wraparound windshield, the forward-control cab looks suave, shades flipped down, as if it’s heading for a slick Hollywood party. But General Motors shows SURUS with and without the cab; the platform alone is capable of autonomous convoy missions. The vehicle’s platform mounts on the superstructure above the chassis and can accept a variety of cargoes or bodies. The fuel cell produces electricity for export to tools and equipment, as water-vapor exhaust is the byproduct of electrolysis, and SURUS even acts as a drinking-water source. With off-road-driving capability and 400 miles of range, SURUS has obvious military as well as commercial applications. The Volvo Vera concept, unveiled in September at the IAA Commercial Vehicles show in Hannover, Germany, is another mind-bender. Because no driver is needed — and, therefore, no cab — this battery-electric drone semi-tractor has a swoopy profile like a sports car’s. In overall appearance it resembles a shaver’s charging base-on-wheels more than a heavy-duty truck. To a Teamster, it may resemble doomsday itself. Also in Hannover, Renault recently revealed the EZ-PRO, its startling concept for last-mile delivery. 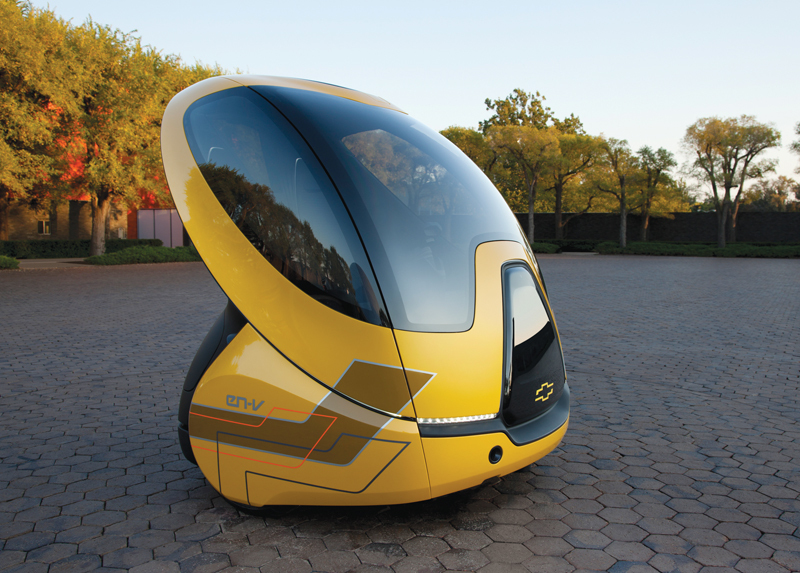 Rather than the Vera’s voluptuous form, the EZ-PRO is an android pod-van with faired wheels, like the GM Autonomy. The concept calls for an EZ-PRO platoon to set out from a retailer or a warehouse with a human “concierge” in the lead vehicle. This concierge, who occupies front cabin space, uses a joystick controller. Like the Navya and the SURUS, four-wheel steering enhances maneuverability. When a pod arrives at its destination, the customer opens a locker by using a smartphone app. Ford will offer a similar service using its Transit vans sometime in 2021. From a regulatory position, the U.S. Department of Transportation in October released a new guidance, “Preparing for the Future of Transportation: Automated Vehicles 3.0,” announcing, among other things, a revised definition of “driver” to include an automated system. Meanwhile, under every 10-gallon hat is an idea. Shaoshan Liu, co-founder and chairman of Perceptin, a parts-maker for autonomous systems in California, aims to bring down costs and has proposed a modular system that would let people assemble and modify their own vehicles using what he calls a “Lego-like” approach. From the same platform, people could address diverse purposes ranging from agriculture to mobile vending in much the same way the Ford Model T was adapted for everything from a produce station to a 10-passenger bus, or the Volkswagen Beetle morphed from commuter car to a Baja 1000 racer. The Vision Urbanetic is an integrated swap-body system for people movers and cargo vans. The people mover looks like the aftermath of misdeeds in a sheet-aluminum factory, “and then somebody hit it with a flamethrower,” Snyder says. He also liked another recent reveal, the Volvo 360c concept. The autonomous electric vehicle has interior space designed for sleeping, office, living, or entertainment purposes. For sleepers, Volvo has devised a safety-blanket restraining system. Among other innovations, the 360c proposes exterior lighting that Volvo Cars calls “a new, global standard in how autonomous vehicles can safely communicate with all other road users.” Snyder took up that thread, observing that pedestrians should indeed be notified, especially by a quiet EV. Nicholas G. Evans has an apartment in a converted mill building in Lowell, Mass., the seat of the American Industrial Revolution. He finds obvious parallels between the Merrimack Valley’s gutted textile industry and the incipient revolution in mobility, which would replace professional drivers and, if Burns is right about the mass adoption of ride-sharing, also result in a downsized auto sector. “What do these cars do to our society, and what should we do in response to what these cars are going to do to our society?” asks Evans, assistant professor of philosophy at the University of Massachusetts Lowell. For example, if a family of raccoons is picnicking in the traffic lane just beyond the crest of a steep hill, and the only choice is to swerve into a tree, what should the car do? Moral decisions far beyond this quandary have been under consideration. GM’s autonomous concept is proof that designers can start from scratch in this new age of automobiles. Burns credits GM leadership with with three forward-looking moves: purchasing Cruise Automation in March of 2016, gaining self-driving expertise, and engineering the Chevy Bolt EV “so that Cruise’s self-driving system could be factory-installed equipment and built-in high volume when ready.” In 2019, Chevy will begin offering the Cruise AV, although details have been scarce to date. 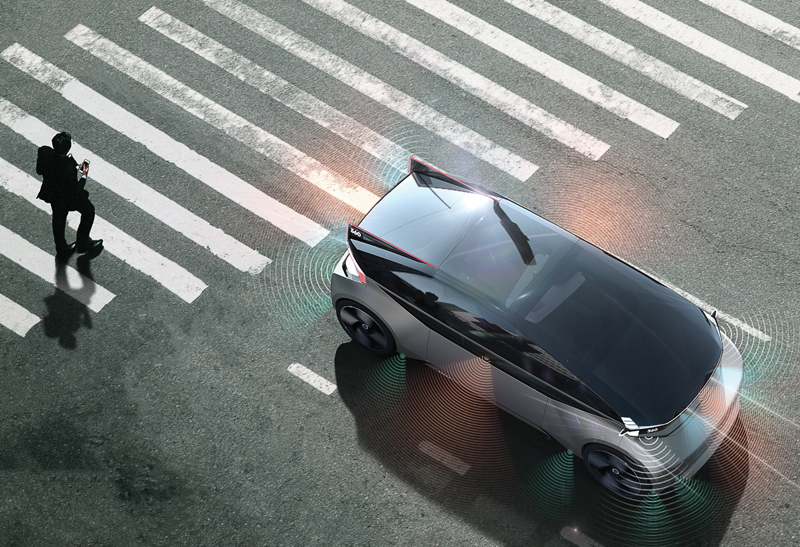 In addition to LIDAR beacons and coded light bars to indicate driving intentions, the autonomous car could be fitted with one more exterior component — namely, a warning sign. 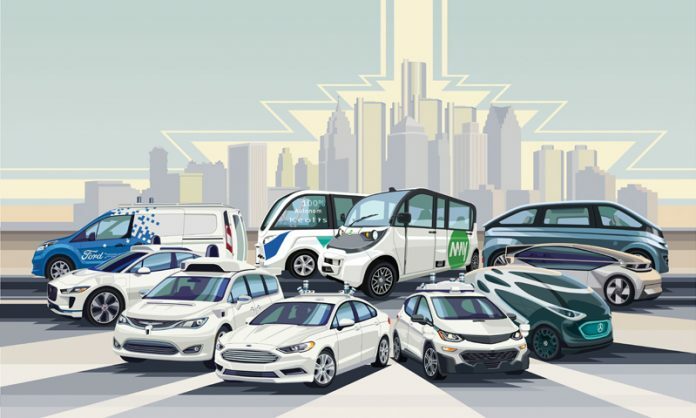 It would signal the disruption autonomy causes to manufacturers, dealerships, municipalities, retailers, public transit, rental car companies, fee-based parking lots, gas stations, and the insurance industry. Even housing could change; if you don’t own a car, why have a garage? Assuming the visionaries are right, forthcoming advances of the autonomous future will include the dwindling of highway deaths, reduced congestion, and transformed cities, and the preservation of petroleum resources. From a car guy’s point of view, the GM EN-V might be the worst thing ever invented. But the gloomiest prognostications about autonomy may be shortsighted. Recent design concepts suggest cars will continue to be a source of joy and comfort (as they must be for a family’s dogs). Branding and status will still signify accomplishment. And opportunities for innovation throughout the auto industry will extend along new avenues yet to be opened. ing executive for cars and crossovers gave his presentation without saying the word “autonomy.” How did he manage it? Level 0: Autonomous system may alert and momentarily intervene without sustaining vehicle control. Level 1: Hands-on autonomy relies on adaptive cruise control and lane keeping, with the driver’s full participation. Level 2: Hands-off autonomy requires the driver to monitor the automated system, intervening as needed. “The shorthand ‘hands-off’ is not meant to be taken literally,” J3016 says. Level 3: Eyes-off autonomy lets the driver become a passenger and engage in other pursuits while still being prepared to resume control. In 2018, Audi introduced Traffic Jam Pilot to fully control the car up to 37 mph on a clogged freeway. Level 4: Mind-off autonomy lets the driver work or snooze; if a problem develops, the car will park itself unless human control is resumed. Level 5: Steering-wheel-optional autonomy describes low-speed vehicles like the Google Firefly and Navya Arma, and their yet-to-be-introduced successor. Paul Snyder, an automotive designer and the Paul and Helen Farago chair of Transportation Design at the College for Creative Studies in Detroit, directs about 200 students in the undergraduate transportation design program. 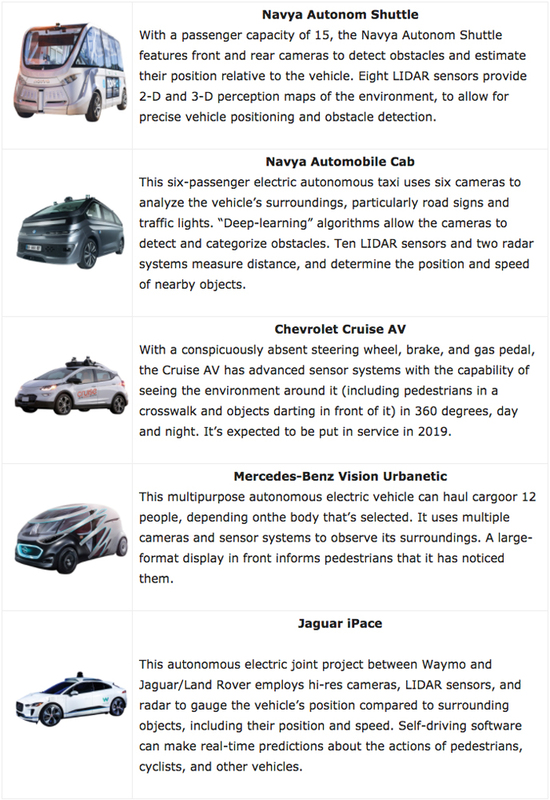 Here (edited for brevity) are two excerpts from a recent interview about autonomous vehicle design and future industry trends. DB: So far, autonomy’s aim is big cities. What about everybody else? PS: The sponsored projects we get here at CCS, I look at them as a signal for what they’re thinking about within their companies. We’ve had a lot of briefs focusing not just on the megacity-urbanization-microcar-autonomy-taxibot, right? But in addition to that, what will people do in rural communities? And more compelling for me is suburban communities. One of the most attractive things about autonomy is how it dovetails with the whole notion of walkable cities. How can we retool the suburbs that are so far apart, to the extent that nobody walks anywhere, so that people can enjoy their surroundings? It can be very beautiful out in the suburbs until you get to the main thoroughfare, when it’s all strip malls. DB: What are students most excited about these days? PS: Many come into the business because they’re gearheads, right? They just love cars, and they love fast cars. They want to some day own a Ferrari or a Lamborghini. That enthusiast gene still lives, and it’s not just in Detroit. Kids come from all over the world wanting to do this. It doesn’t appear there’s going to be any shortage of jobs, because not only is China hiring our recent graduates, but they’re hiring experienced designers from all over the United States and Europe. One of my students had an internship at Tesla. He had to do projects for production programs and was also required to do a personal project. He contrived a Tesla hot-air balloon that would float over refugee camps and drop solar chargers in smaller balloons out of the mothership, if you will, into refugee camps — thereby creating hope for each one of these people who were disconnected. I just thought that was brilliant from a transportation designer. Also, the commercial viability of mobility and the changes at hand, it’s not a secret to anybody. A lot of our students are excited to go to companies like Uber or Waymo. It’s really encouraging to us they’re coming to CCS to look for future designers.